Having been very neglectful of my blog recently I have decided that my New Year’s Resolution is to make sure that I post more regularly. I also hope to craft more regularly next year with some great new ideas for 2012! The last part of 2011 has been so busy for me, working flat out at my day job with the lovely Lisa Dawson, making bespoke blinds and curtains in beautiful North Norfolk, England and as a result I have not devoted as much time to Old Friendship Crafts as I would like. But I hope to change that next year with a new range of products to offer – more to follow in January. 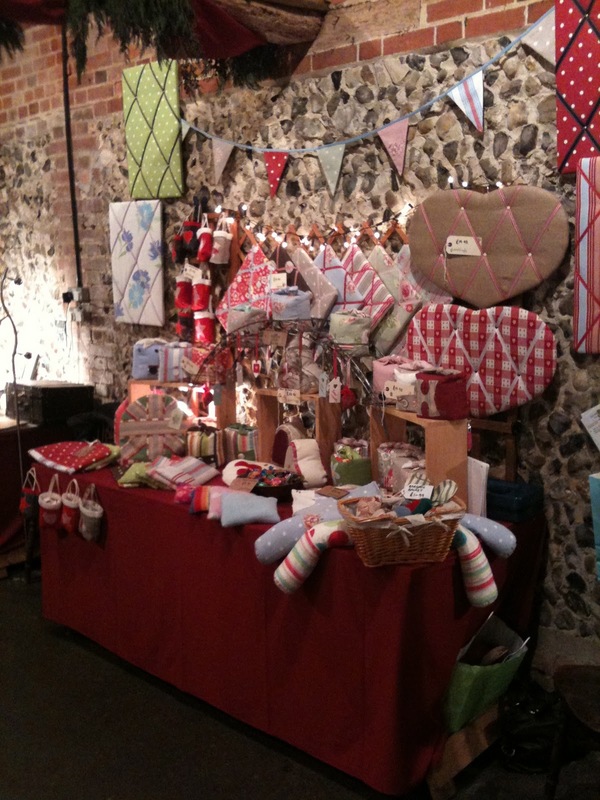 We finished our Christmas Craft season with our last visit to the gorgeous Blackthorpe Barns craft fair near Bury St Edmunds in Suffolk. It was a slight revelation to me as I decided to take Mr Hippy with me to help out – I sold it to him as a weekend away together (sans kids) but failed to mention that we would be selling my wares, two days solid with only one chair to sit on! Anyway, he decided to come and, after a shaky start, had a brilliant weekend. Day one was a bit slow to say the least. I explained the finer points of my products, how they were made, how everything was sourced locally etc so that he could pass this on to the buying public and he did really well, telling everyone about them. But very few sales! Not his fault but the audience that day seemed to be of the “looking only” variety – which I find extraordinary as you have to pay to get in. Anyway, we left after the first day, very despondent, and returned to our pub ‘b&b” nearby – the Thurston Fox & Hounds – check it out – fab breakfast! We needed a strategy and after much discussion (well, about a minute at least) we decided on a “fire sale approach”. Oh no, you’ve sold out, I hear you cry, especially after banging on about the true cost of handmade on this very blog. Well, yes and no. We have a lot of stock, some of which had been knocking around for a while and I really want to try something new for next year, so it did seem a sensible approach to see if we could shift as much as possible (you can tell that Mr Hippy is an accountant, can’t you – it’s all about the bottom line!) And we didn’t give it away! All I can say is the great British public cannot resist a bargain. Sales on day two got off to a flying start (although I did have to reign in Mr Hippy’s enthusiasm somewhat and told him that we were not in Peckham Market a la Only Fools and Horses). Plus the fact that we didn’t want to annoy our fellow stallholders by devaluing their offerings. So objective achieved. Lots of stock sold to make way for new ideas next year and a bit of extra (very welcome) cash to pay for some Christmas goodies. I would just like to mention our next door neighbours at Blackthorpe – Jane Hickman (and her husband Ken) – an extremely talented lady who makes the most incredible Batik pictures – check out her website. Without their company the whole weekend would have dragged considerably, so we hope to see them again next year – that is if we get invited back! I hope that you all have a wonderful Christmas and New Year.